As part of our 2015 Evocative Web study, POPSUGAR Insights explored the relationship that women have with native advertising and the role that high-quality visual content plays in creating emotional connections with women. We studied the impact that high-quality content has on women's post-exposure digital behaviors, especially as it pertains to product purchase. In general, our research found that 76% percent of women feel that messages you see are more memorable than messages you read or hear. And, according to the women we interviewed during our qualitative sessions, high-quality images by brands help women get interested in what a product, brand, or company might have to offer and pull women into the experience, creating a desire to learn more about the brands or products. 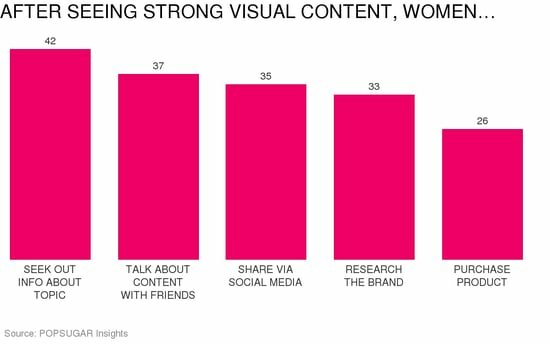 After seeing strong visual content, women typically seek out additional information about the topic (42%), talk about the content with friends or family (37%), share the content via social media (35%), research the brand that was featured in the content (33%), or purchase the product featured in the content (26%). Of those who typically purchase the products, 19% of women visit an online site to buy the product they saw and 12% visit a brick-and-mortar store to buy the product they saw. Overall, 68% of women say that they are more likely to purchase products from brands that use high-quality visual content, with millennial women (70%) and young millennial women age 18-24 (75%) far more likely to buy products.